Rolling ball FountainGranite floating sphere fountain/ball fountain/rolling sphere fountain /floating sphere fountains are perfectly balanced, polished stone sphere that fits into a socket (base) carved to the exact curvature of the ball. The Granite globe revolves 360 degrees in all directions and actually floats on a thin film of water. Floating globe water features fountains for residential and commercial complexes. Kugelbrunnen low-maintenance center-pieces for public spaces and private residences, indoors and out. Large outdoor Stone sphere fountains for science city,Olympic grounds and children parks. If your are interested or buy Gian granite sphere fountain 1meter to 2 meter e-mail us for special pricing. Water is pumped up from beneath the socket, lubricating the marble globe and forcing it to turn gently - no belts, no pulleys, no rubber wheels! It operates at a surprisingly low pressure. Once started, the sphere continues to turn until the water is shut off. However, even a child can stop it, change the direction of spin, and set it on an accelerated twirl. The space between the stone ball and the socket is about 8/1000th of an inch—too small Any motif or design can be engraved. Has a granite ball floating on a pressurized stream of recirculated water. This rotating globe is recommended for use in main entrances, shopping centers, gardens, etc. Fountain stone ball has a unique/special feature of having geometric center perfectly coinciding with the center of gravity. In Floating spheres we can etch the map of the world or any other design on the ball as per customer requirement. Our Garden ball Water Feature Sculptures are massive pieces of high precision solid stone, floating and rotating freely with the water as it flows from beneath the sphere (ball). Available in marble sphere diameters from 12" to 10'. The sphere fountains is ideal for exterior Landscape designs and interior applications, both commercial and residential, with custom designed bases available to meet your special needs. Rotating globe fountains 40cm to to 250cm in diameter mystify, attract and enthrall visitors. These beautiful stone balls, sculpted of highly polished granite, are precision engineered to float on a thin layer of water. Rolling ball water features are necessary for the long life and perfect operation of your granite ball fountain. The space between the ball and the socket is about 8/1000th of an inch—too small Any motif or design can be engraved. Has a granite ball floating on a pressurized stream of recirculated water. This rotating globe is recommended for use in main entrances, shopping centers, gardens, etc. A Kugel is a heavy ball perfectly balanced on a base that matches its curvature. A water source creates a thin film of water beneath the ball. This water creates a lubricant allowing a small child to spin a several thousand pound ball of stone. Kids love pushing these huge several thousand pound balls. several kids trying to get it spinning. Sometimes they will keep spinning even without anybody pushing on them because of their mass and balance. you can buy directly from us .just fill inquiry form for prices,photos & videos of spinning marble balls . A multitude of styles and shapes are available for bases and containers, including self-contained fountains. The sphere fountain or collaboration Decorate Backyard gardens,outdoor landscape garden ,main lobbies ,hotel reception areas, residential home , and outdoor applications such as water parks, office buildings, and restaurants. These Natural Stone fountains are available with granite ,sandstone,slate,limestone or marble rotating spheres beginning at 10" in diameter to larger 8 feet or more with sure ,round,hexagonal,rock and natural boulder bases available to meet your special needs. a manufacturer of granite rolling ball fountains, is located in the historic city of Jalore, northwestern India. We have nearly 30 years experience manufacturing the kugel ball fountain, a type of granite ball fountain or marble ball fountain, seen at famous locations across the world. Kugel is the German word for ball or sphere and is used for many types of revolving ball fountain, spinning sphere fountain or rolling ball sculptures. When you order your ball fountain from Granite Globe , you will know that the marble or granite for these natural stone water fountains is hand selected by our experienced masons and stone workers so that only the finest material is used to manufacture your floating stone globe. Our award winning stone cutting machine was developed by the founders of Granite Globe in the 1990’s and this engineering feat is what makes the precise cutting of a moving sphere fountain, or globe fountain, possible. The principles behind a rolling stone globe are actually quite simple. But, as with many things in life, making them actually work is a lot more complicated. To make a ball water feature, we start with a block of granite or marble that you have chosen from the many styles and colors available. We can manufacture a fountain stone ball or marble stone ball in sizes from 1 foot to 10 feet in diameter. The cutting and polishing of these floating spheres has to be extremely precise as the exact fit between the fountain ball and the curved base is what allows the magic to happen. When water is pressed between the curved base and the water feature sphere, the small film of water (about 8/1000th of an inch) causes the water feature ball to hydroplane and rotate. One might think that you would need a huge and expensive pump to float a massive garden water feature ball but the pressure needed is about the same as comes out of a standard garden hose. 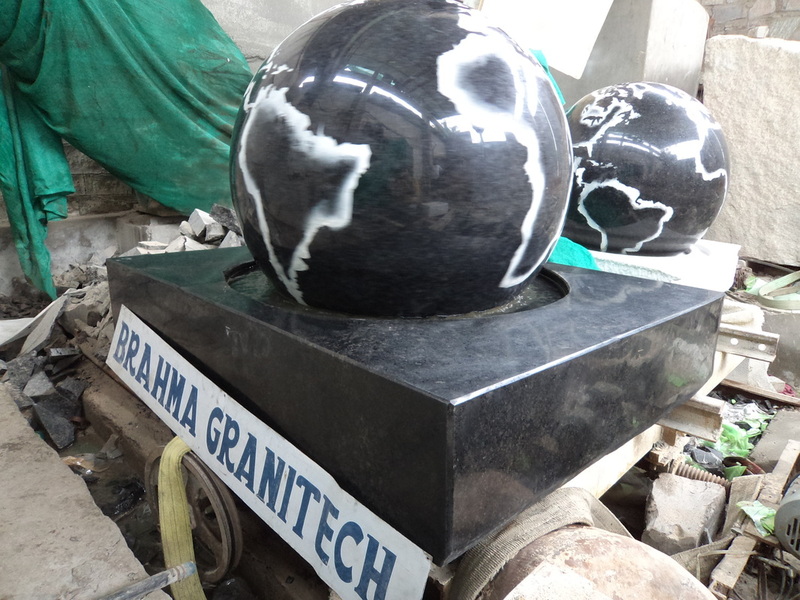 Granite Globe with work with you from start to finish, achieving the design and looking that you desire. Bases are custom designed to your specification and both the base and the ball can be engraved with any motif or logo. You will follow the manufacture of your water feature sculpture from stone selection to finished product. We send photos along the way and many customers choose to display these production photos to further amaze visitors. Your rotating globe fountain will be securely shipped in hardwood crates reinforced with welded steel corners. We assist you will all shipping and paperwork. We offer installation guidance customized for your application and will work with your builders and engineers to offer advice so that you can achieve the best result from your investment. Stone Ball sizes available in 150mm=6.0"
marble ball available in 1 feet, 2 feet, 3 feet, 4 feet, 5 feet, 6 feet, 7 feet, 8 feet diameter.